This aerial captures a portion of the Line and LaVilla’s Chinese district along West Adams Street during the early 20th century. 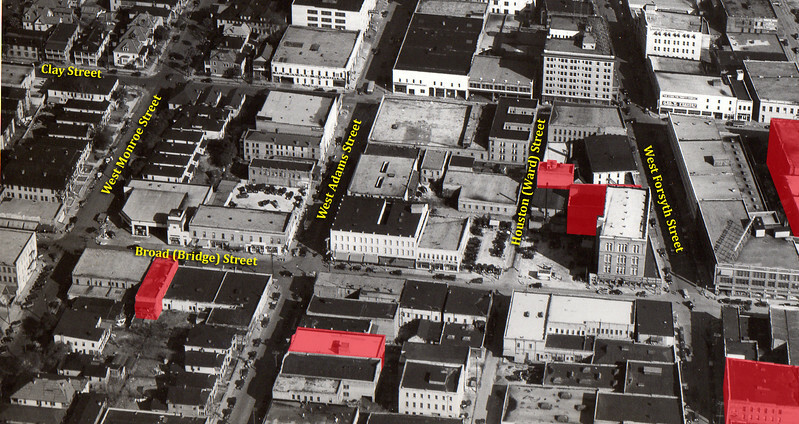 After a century of demolition first downtown revitalization strategies only the buildings highlighted in red remain standing in 2019. Despite the notoriety, the Line created an economic opportunity for many minorities facing racial and sexual discrimination. This includes Jacksonville’s early 20th century Chinese community, which established a monopoly on the local laundry business, leading to LaVilla emerging as a concentrated location for Chinese-owned businesses and residences. By 1910, 14 of the city’s 25 Chinese-owned laundries were concentrated along or within two blocks of West Adams Street between Johnson and Clay Streets and 67% of the city’s Chinese population lived in LaVilla. Despite the small but concentrated population, Chinese immigrants faced the constant threat of discrimination, including an incident in 1900 where 32 laundrymen were arrested and held in jail, facing deportation until they could prove that they were U.S. citizens. Unfortunately, LaVilla’s Chinese community ultimately succumbed to the Great Depression, strict immigration laws, and deportation. Born in New Orleans, Jelly Roll Morton is an example of an early jazz great who spent time performing in brothels prior to gaining fame on a national level. Morton also lived in LaVilla for a few months, performing in local theaters and saloons. 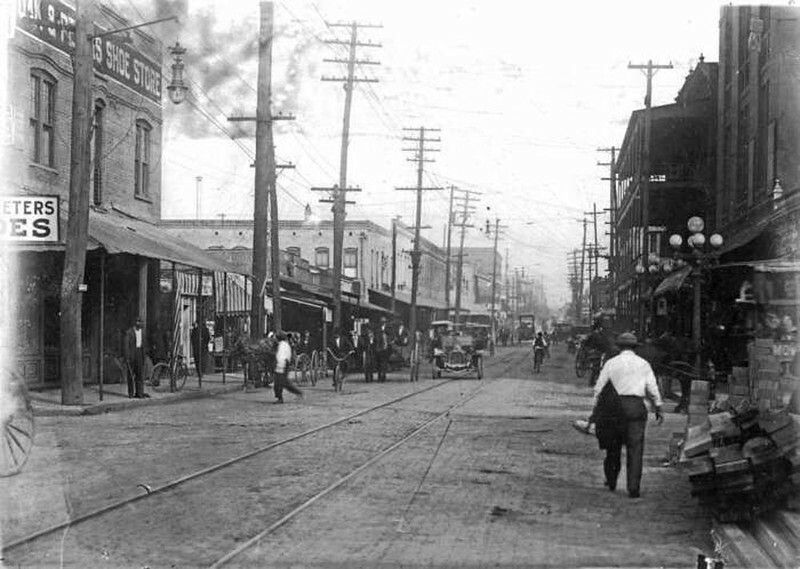 The Line also paved the way for LaVilla’s development into an early epicenter of ragtime, blues and jazz. Combined with the railroad, the presence of a large progressive black community in the Jim Crow south, and a red light district employing black musicians and performers, LaVilla emerged as an African-American cultural exchange partner with New Orleans. During this era, individuals such as James Weldon Johnson, John Rosamond Johnson, Zora Neale Hurston, Ma Rainey, Perry Bradford and Jelly Roll Morton helped developed a culture of black entertainment and enlightenment culminating with the first published account of blues signing on a public stage occurring in LaVilla and the Jacksonville Rounder’s Dance growing into the nation’s most popular dance during the 1920s. Myth has it that jazz originated in the streets of New Orleans and by the turn of the century, New Orleans and Jacksonville naturally become cultural exchange partners. LaVilla became a brief haven for musician John Robichaux following the elimination of the relative privilege of the Creole racial distinction in New Orleans and just before the implementation of Florida’s most restrictive segregation laws. In both New Orleans and in Jacksonville, musicians were regularly hired to perform in the parlors and saloons of the notorious red light districts. Looking north on Bridge (Broad) Street at its intersection with Ward Street. As the Line’s popularity increased, the number of “honky-tonk theaters” like Chappelle’s Excelsior began to grow. Honky-tonks were primarily drinking establishments featuring entertainment that catered to a predominantly black audience. Other honky-tonk venues that operated within the Line included the Little Savoy Theater, Baxter and Cashen’s Saloon and the Exchange Theater. The Line, as a music destination, also benefited from John Rosamond Johnson returning to town in 1897 and teaching private music lessons from his parents’ house in the district for a few years before moving back to New York City. Furthermore, much of The Line’s real estate was woman-owned, and women in the area would later go on to establish several of the hotels and restaurants on nearby Ashley and Broad streets.